Are you in a toxic relationship? Would you know if you were? Topping their list of responses was “You spend more time fighting than enjoying each other,” with a whopping 82 percent of the vote. 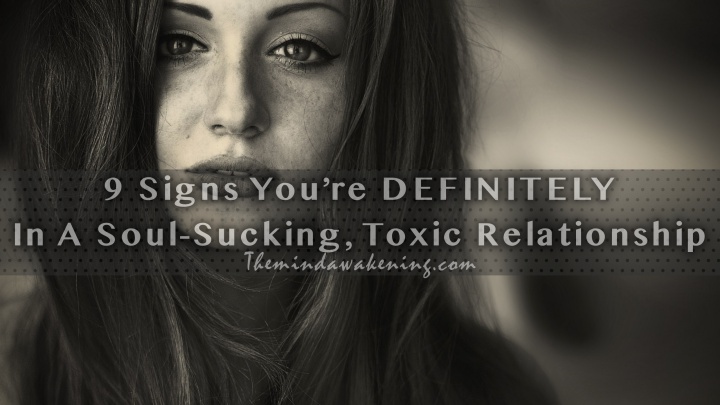 But that’s not the only sign of a toxic relationship. 1. He seems hostile all the time. 2. He puts you down. 3. He purposely avoids you. 4. He refuses to change or talk about problems. Is your partner open to being influenced by you? Is he/she self-reflective? When you express how you feel and ask for what you want, does he/she listen and make an effort to meet your needs? 6. You don’t act like yourself. 7. He acts like an over-involved parent. I’m not talking about the kind who drives you to your violin recital; I’m talking about the kind who decides your career, what school you go to and who you hang out with. 8. He’s the king of guilt trips. 9. You hide your relationship from friends and family. Your family and friends don’t like the way he treats you. Since they are more likely to give unsolicited relationship advice, you’re afraid that what they have to say may be the truth. So you tend to avoid talking about him, bringing him around, or involving him in any way with your friends and family.